NEW YORK, March 28, 2018 /PRNewswire/ -- Today, Genesis unveiled its groundbreaking Essentia Concept at the New York International Auto Show. The all-electric, high-performance concept elevates and reimagines the "Athletic Elegance" design paradigm, while providing a vision of future Genesis product performance and technology. 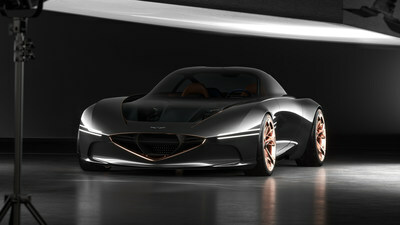 "We understand our obligation as a luxury car manufacturer to create objects of desire, sparking passion and inspiration by emphasizing a culture while exceeding expectations in terms of technology and connectivity, bringing our outside world seamlessly to the inside of the vehicle," said Manfred Fitzgerald, Global Head of the Genesis Brand. "This is what the Genesis Essentia Concept is all about, and we are thrilled to introduce our interpretation of an all-electric, two-door Gran Turismo here in New York." Essentia is the brand's first battery electric vehicle and features a lightweight carbon-fiber monocoque, a robust, multi-motor electric powertrain, and a custom-tailored interior. Essentia is the brand's initial concept for a true GT car and challenges the status quo as the ultimate manifestation of Genesis design and engineering. As a capable, thrilling sports car designed to counter the complexities of a modern lifestyle, Essentia offers serenity, clarity, and beauty. "The Genesis Essentia concept defines our vision for an electric Gran Turismo that integrates Athletic Elegance and Genesis DNA as defining parameters," said Executive Vice President Luc Donckerwolke, Head of Genesis Design. "A Gran Turismo typology highlights our ambition as a luxurious car brand for the connoisseurs and it is the perfect base to project our DNA in the future." Throughout the design, the philosophy of "Athletic Elegance" has a prominent role, marrying power and precision through artistry. Essentia takes its inspiration from iconic Gran Turismo proportions, with a long bonnet and a swept-back cabin. Finished in Stardust Gray Metallic, the carbon fiber-bodied Essentia is positioned low to the ground intentionally, to make it instantly recognizable through a graceful silhouette. "The search for dynamic proportions was contrasted with advanced aerodynamic flows to highlight the bionic combination of performance and aesthetics," Donckerwolke said. "Essentia embodies the genetic elements of the Genesis design." "On the interior, purism has also dominated the creative process for the interior skin, the layer in contact with the occupants, but less traditionalist the connection between the outside skin and the internal structure. We connected both with our flowing G-Matrix that uses a dynamic web allowing lightness and internal air flow. This highlights the exciting opportunities being explored in 3D printing which transcends the lengthy, inflexible and costly tooling process," said Donckerwolke. The interior of Essentia utilizes a mixed-material approach influenced by high fashion and classic color combinations. 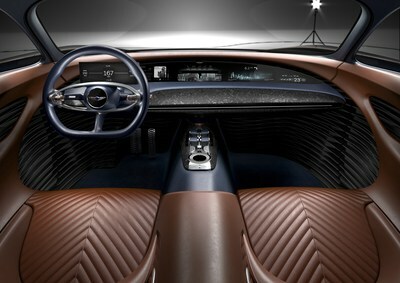 Cognac leather seats with herringbone quilting envelops the driver and passengers in true cockpit fashion. A slim center console covered in Oxford Blue leather bisects the cabin. Blue velvet covers the roof and its pillars. The front and rear seat belt slots are out of the ordinary, as well, composed of glass pearl finished/treated aluminum and polished aluminum. Layered carbon fiber décor adds a sporty and technical element to the interior details, with a 3D optical effect achieved through the latest technology of layering individual pieces of carbon. 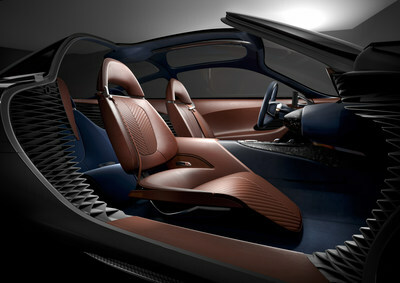 The rear seats, which are accessed through Essentia's butterfly doors, are covered in contrasting, Oxford Blue leather. In line with Essentia's purpose as a true grand tourer, a luggage compartment behind the rear seats affords plenty of cargo room for a weekend road trip with no particular destination in mind. Underneath the carbon-fiber monocoque of Essentia is a state-of-the-art, high-density battery pack and multiple electric motors that enable a powerful, confident driving experience. The electric powertrain allowed Genesis Design to redefine classic GT proportions with an extremely low, transparent hood that flows seamlessly into the windshield and the "bubble" roof. For those moments when knowing what's ahead is critical, Essentia features advanced vehicle-to-infrastructure and vehicle-to-vehicle technology. Essentia can inform the driver of up-to-the-minute road conditions, and help avoid accidents and traffic jams. Further to that, instead of simply providing the quickest or most efficient route, Essentia uses machine learning intelligence to recommend routes based on driver inclination. And when the route is chosen, Essentia automatically tailors the driving character to its owner's preference for that road. From seat position to powertrain performance and audiophile system to chassis settings, the joy of the journey deserves technology to match. Genesis Motor America, LLC is headquartered in Fountain Valley, Calif. Genesis is a global luxury automotive brand that delivers the highest standards of performance, design and innovation. A total of six new Genesis models will launch by 2021 and will compete with the world's most renowned luxury car brands. All Genesis vehicles sold in the U.S. are covered by an industry-leading warranty with enhanced roadside assistance and concierge services. In 2017, Genesis received accolades from leading third-party media and analysts, including ALG, GOOD DESIGN, J.D. Power, and Strategic Vision.